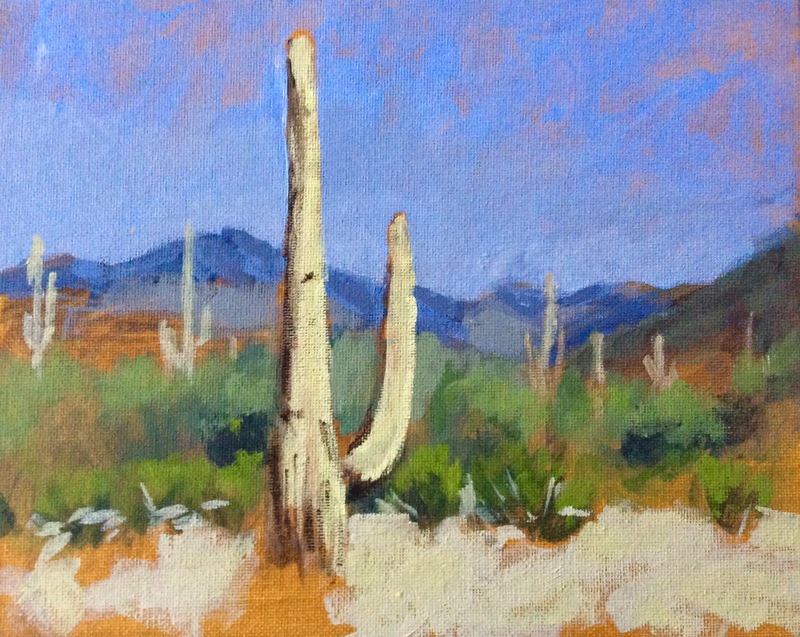 When I decided to take the Plein Air Journey, my intentions were to create paintings along the way. Many marvelous landscapes were seen; but alas, few paintings have resulted. A fast pace of travel did not allow enough time to explore, and to also paint. So, I’m going to slow down now, and focus more on the artwork. After using oils for most of my career, I switched to acrylics when I hit the road. The advantages of water based media meant less odor, faster drying time, and easier storage of finished pieces. It seemed a wise choice for the confined space of a small motorhome. However, I did not anticipate all the difficulties I would encounter. 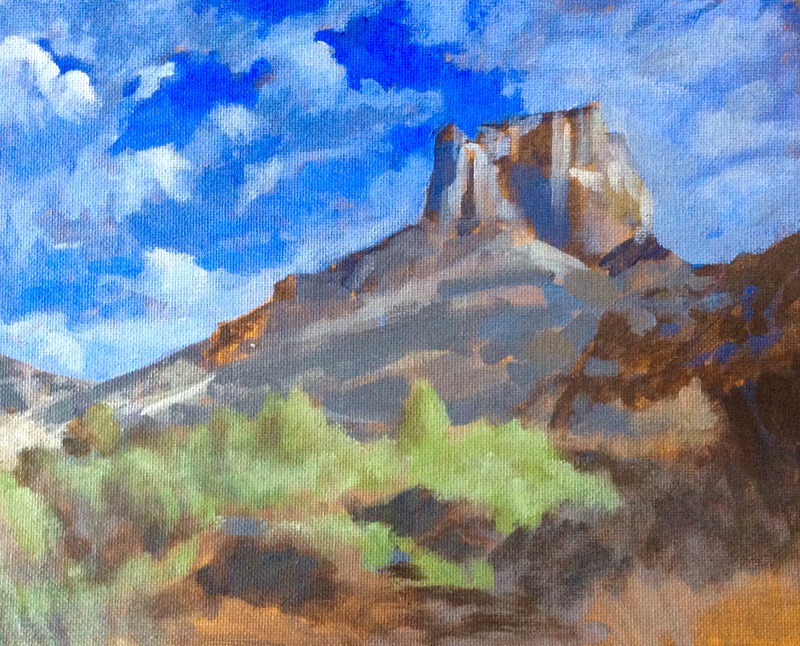 I have struggled mightily with the transition to acrylics. Their quick drying time has been too rapid; almost as soon as a stroke hits the canvas. Yikes! Clearly, my approach needs to be changed in order to accommodate the characteristics of the paint. Normally, I would not reveal the mistakes and stumbling that often occurs. An artist prefers the successes be seen, not the failures. But, I need some motivation! So, I’m hoping that by sharing the process I will make steady progress. Perhaps you will enjoy watching, and maybe offer suggestions. 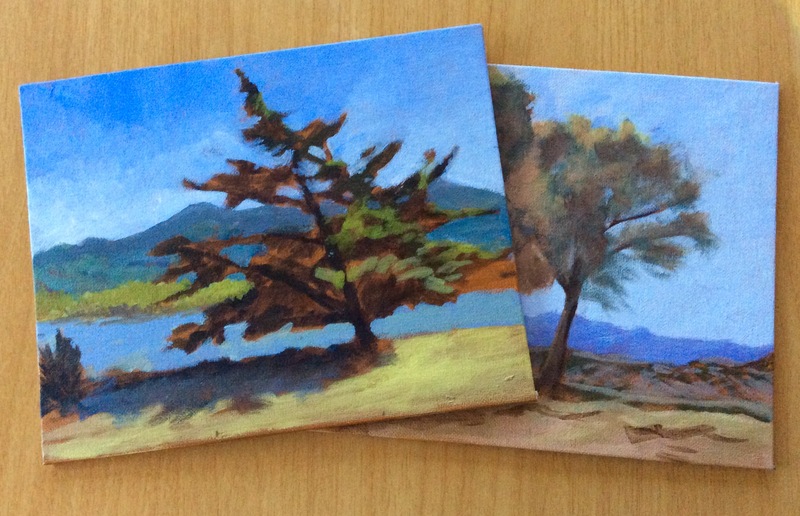 Two paintings, started previously, will be the first to undergo the shared experience. 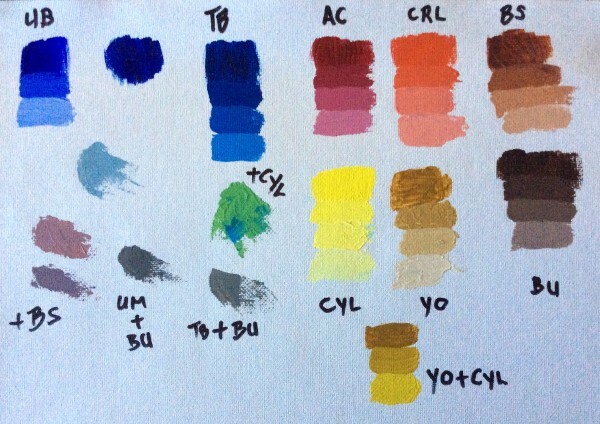 If I am to master these acrylic paints, then new skills and procedures need to be learned. Please follow along as I practice using acrylics in an attempt to improve. Well, I hope to share more as I go. To see more of my paintings, select the Art link on the top menu, then Porfolio. Excellent post. I never thought about what materials you paint with. Thanks for sharing the information about the switch from oil based to acrylic. I understand about the smell. How long does it take for the oil based paint to dry? Is it measured in hours or a day or two? With the oil based paint, when it dries is there a texture that could be damaged from contact with another object? Take care! Your talent is amazing! Depending on the environment, oils can take a week to be dry on the surface. But, it takes months to be completely dry all the way through. During that time, they need to be protected from dust and contact to prevent damage. AH! This IS the post that I’ve been waiting from you! What you call your “mistakes” speak encouragement to me, my traveling friend. I too started out with oils and switched to acrylics, but under controlled circumstances. When I went out for the first time last November to do my first 2 Plein Airs, I felt like I was beaten and disheveled. Watching your progress will become new inspiration for me and I’ll be looking forward to your posts of progress and accomplishments. You’re starting out awesome! Thanks for the kind words and encouragement Bud. It’s comments like yours that will keep me motivated toward progress. I have not the artist abilities that you have exhibited so count this as worth very little. My effort with watercolors and their workability has been fun. My efforts with acrylics has been just as you have experienced. I even tried some retarder for the acrylics and they were still just too fast at drying for me. In my feeble watercolor attempts I have relegated acrylics to where I need a very opaque hue in small quantity like droplets of white sea spray or pin points of brightness for flowers. Getting value variations in acrylics has been nonexistent in my attempts. I think my trouble is that I do not move or think fast enough for acrylics. So now, I use watercolor pencils and tube paints for my meager efforts. It is a much more peaceful medium to me. Using opaque paint for details is a good choice. Great that you’ve discovered that technique. I gave up on watercolor a long time ago, as it’s near impossible to make corrections. Glad to hear you are finding alternatives that work for you. Good for you!! I have been on the road in Quartzsite and Yuma for 2 weeks, and my acrylics remain safely stashed in the under-bed storage of the RV. Now, I feel the challenge! Perhaps together we can figure out how to make this acrylics thing work. Hope you provide me some advice from your experience. I have tried using gel matt medium some, but need to try it more in the desert winds. Those are two things I’m going to be trying with my practice paintings. They are supposed to retard the drying time somewhat; so, I’m hopeful they will help. I think it’s a wonderful idea to slow down the travel and concentrate on capturing the memorable scenes along the way. The desert areas are dry and I don’t suppose there is any remedy for quick-drying. I believe you are correct on both counts, Martha. Here’s hoping the change will be beneficial. Have you ever considered soft pastels? They’re more direct and quicker than any other medium and you don’t have to worry about drying. Looking at your paintings, I think you would be good at it. I have used soft pastels in the past. While they don’t require drying time, they are very fragile; and protecting them while traveling in an RV would be difficult. Thanks for the suggestion though. I use acrylics while traveling. I have been painting since 1974. There is a technique to using this medium and it took me some time to master it. Unlike oils you can’t blend as well on the canvas. Most all of your blending has to be done on the pallet. The more expensive brands of acrylic do better as far as drying time. I think you are doing quite well from what I have seen from you paintings. Keep using the acrylics and I think you will see that you can work wonders with them over time. Thanks for the suggestions and encouragement, Joe. Time will tell if I can adapt. Nice to have the inside info about Chroma. I’m using Golden Heavy Body, and will try some glaze and gel to modify the working qualities. Love your paintings. Have been anxiously awaiting some painting posts. I’m trying to switch to water based oils. Slowly getting there. Might they work for you? Acrylics – I’ve had same troubles you experience. Many tell me they are easier now. Have worked with and travelled with soft pastels for many years. I’m rough on them & they survive well. I prefer the immediacy of them. They are easily stored. Thanks Dorothy. Posts about painting will come eventually. Water based oils might work if the acrylics prove too difficult. But, the last time I tried the w/b oils I didn’t like them. Pastels I think would be too fragile when traveling. Stay tuned. When I used acrylics, had a spray bottle of water at my side. Misting paints & painting helps. I have padded boxes that my pastels travel well in. Terry Ludwig sells Landscape sets , i keep them in the well padded box they sre shipped in- in my trunk at all times. they travel well. Problem framing – gets expensive. Storing unframed is easy. I stack them on top of each other in plastic grocery bags. Unframed they are easily stored. (on sanded paper-)many can be stored in small spaces. I have a small misting bottle to keep the paints moist. Using the correct amount is the trick. Don’t think I want to go with pastels, although you give good tips. It will be enough if this old guy can adapt to the acrylics.